For a while now, I’ve been searching for something that might explain where the image of Taurus near a cylindrical manger might come from. I found nothing in astrological imagery. Even outside of zodiacs, most of the medieval images of bulls that I found represented them in nature, or interacting with other animals and people, or grazing in fields, or eating out of rectangular troughs. The cylindrical manger seemed elusive. In this seasonally appropriate post, I will be exploring the possibility that the Voynich Taurus could be derived from the imagery of Nativity scenes. In Nativities, the round manger is a lot more common than in any other genre of medieval art. It is often represented as a structure made of wattle or some other type of basketry, which offers a compelling explanation for the criss-crossed pattern that is present on the manger in the Voynich image. Bulls in Nativity scenes are most commonly portrayed near the manger where Jesus is laying, gazing upon him. Their position in the scene conveys either that they are adoring him (based on the 7th C Gospel of pseudo-Matthew) or that their breath keeps the baby warm (according to oral tradition). There were variants of course, and medieval artists sometimes presented the bull as rather unconcerned with Jesus’ birth, or focusing on the food. In most nativity imagery however, the bull is not portrayed eating, but rather looking on, with his head hovering just above a manger, usually the one Jesus is laying in, but not always. The bull with a round manger motif in Nativity imagery is found in many places, as these examples show. Geographically, this iconography alone cannot really help us to pinpoint a local tradition which the Voynich image would fit. Chronologically, however, the period is very restricted: all of the images I found were from the mid 14th to the mid 15th century. In this sense, the Voynich Taurus imagery appears to be firmly rooted in its time. 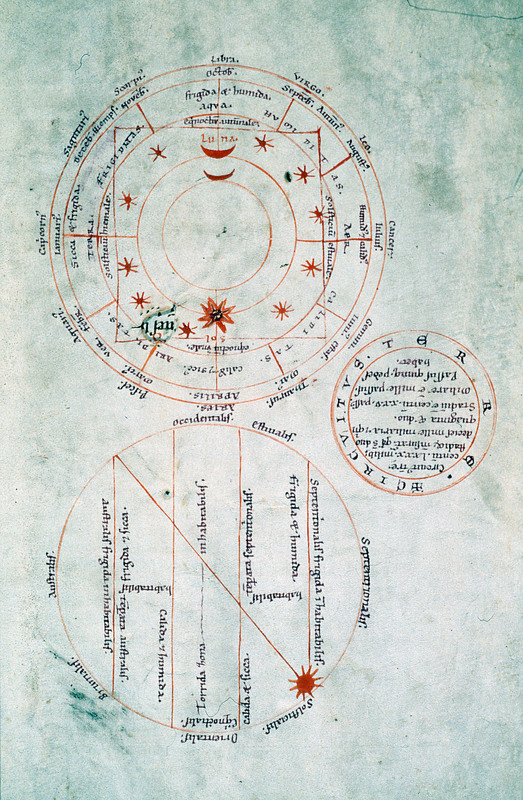 If the Voynich Taurus is based on Nativity imagery, this means that the period of production of the source material was very close to the time of production of the Voynich manuscript: the artist who created the Voynich zodiac roundels was inspired by recent or contemporary material, rather than by an older source. How would Nativity imagery find its way into a Voynich zodiac roundel? In many medieval works, especially Books of Hours, Psalters, calendars and almanacs, both astrological imagery and biblical scenes can be found. In my opinion, the Taurus roundels could result from the presence of a Nativity in a book of Hours (or other such book) from which the Voynich artist drew his inspiration. We don’t know what the Voynich text says, but some researchers have suggested that the human figures which surround the central roundels in the Zodiac section could have some relationship with the theme of fertility, pregnancy, or the cycle of life (for example, this one ). If this possibility is entertained, the use of a Taurus borrowed from a Nativity scene would be rather fitting. This image is very close to the nativity images I posted above, especially the Ethiopian example. It opens the possibility of a shift from Aselli to Taurus via the light and dark pair of the bull and donkey in Nativity scenes. But as MarcoP points out, this doesn’t account for the doubling of other signs in the Voynich, so we are still missing many pieces of the puzzle. Thank you for starting this interesting discussion, VViews! A secondary detail that is not clear to me is why you wrote that, in nativity scenes, oxen “are always depicted as bulls”. An ox is a castrated bull, so the two are typically depicted identically and there is no way to tell one from the other, I think. Also, thanks for the link to the Hourihane book! That will be my weekend read. I hope we do find a zodiac cycle with a bull near a round manger one day… that would probably be a bit of a game-changer in terms of being able to place the Voynich zodiac, as it seems to be extremely rare! “From the astrological iconography point of view, the Taurus at a well is somewhat strange – unless an image of donkeys was a basis for it and then it would refer to Cancer – but that is certainly going too far”. If you navigate to img 9, you will see the first half of a celestial planisphere. The detail I want to point out is that the image of Cancer includes Aselli and Praesepe: two Asses eating from a Manger. thank you for your comment, this is very interesting stuff and it took me a few days to process the info and take a look at the relationship between Aselli and Praesepe and Taurus. Reading your comment, these latest developments give new promise to the possibility that Ewa Sniezynska-Stolot had dismissed as “going too far” about the Taurus iconography being connected to Cancer. The Manger cluster (Praesepe, aka M44, aka the Beehive, aka Little Cloud for Hipparchus or Little Mist for Aratus) has long been believed to share a common origin with another star cluster, the Hyades, which are in Taurus. The best period for viewing the Manger cluster is between February and May, a period which includes the sign of Taurus: is the presence of the Manger in Taurus an illustration of the fact that this is a good time to observe the star cluster, or that this is when it is most influential? The period between February and May, during which the Manger is most prominent, also corresponds to the period during which the Voynich nymphs are in tubs, from Pisces to Taurus. The Taurus-Cancer connection is possibly also suggested by the artist in that the two animals in the Voynich Cancer are light and dark like the Taurus and Aries pairs. As for the Aselli, they are also generally considered as a bad omen, with the exception that they are said to have favorable effects on astrological work itself. I have not yet found any medieval images of these clusters outside of the example you showed… I’ll keep looking. Thanks for sharing the NLW MS image! I have found an illustration of Aselli and the Manger in ms BAV Vat.gr.1087 f302v. It is an exceptional XV Century Byzantine manuscript. From what I understand, it is the only surviving exemplar of a Greek tradition of illustrated Eratosthenes manuscripts. It appears to be related in an unclear way to the Aberystwyth manuscript we previously discussed. quotes Weitzmann, “Roll and Codex”: “no other Greek manuscript with constellation illustrations is known”. MarcoP thank you for this comment! The Aselli illustration from Vat. Gr. 1087 is a real breakthrough and shows more commonalities with the Voynich Taurus roundels than any illustration I have seen so far. The Aselli influence also would acount for the peculiar appearance of the Voynich bulls themselves. The shift from bull to donkey might be explained via Nativity imagery, as we can see in the images in my post (and in others), the bull and donkey are often almost indistinguishable, with one typically dark and one light. Your incredible find now leads me to wonder: did the Voynich artist base himself on an image of the Aselli to create a double Taurus, or are the “double Taurus” folios actually a depiction of the Aselli? Hello Voynichviews, I am happy you find Vat.Gr.1087 interesting! Actually, I think this could be the most detailed medieval illustration of Aselli: it is possible that Ewa Sniezynska-Stolot was thinking of this specific image when she alluded to the donkeys as a basis for the Voynich Taurus illustration. The 1933 essay by Panofsky and Saxl in which I found a reference to the ms dates it to the XV Century (fig.8). I want to thank you again for this interesting post and I hope that other relevant images will come up in the future! Fig.32 presents a page from Stiftskirche ms 685: Pegasus is illustrated as eating from a bowl with a net-like pattern similar to that of Voynich “light” Taurus. The net pattern is indeed reminiscent of the Voynich Taurus basket design, and the proximity to an image of Aries is also worth noting. Aside from the illustration you noted, it also features a nice Cancer as crayfish and Leo with protruding tongue… but the other signs are different from those in the Voynich. Thanks VViews, I hadn’t seen the other images! The diagram at 70v, with the Moon and Sun marking the Autumn and Summer equinoxes, is an interesting parallel for Voynich f68r2.